All I can say is OMG… Oh My Goodness, I think I am in Heaven!!!!! How can toasted coconut flakes taste like Frosted Flakes??! I am still puzzled by this but grateful I figured it out!!! My intention was to figure out a nut-free and quicker version of my already popular granola recipe on the blog. The current recipe is delicious and everyone loves it but because I have recently started cutting back on the amount of nuts and nut products I consume (see THIS blog post), I needed to tweak the recipe. This recipe also eliminates the use of eggs. Eliminating nuts from the existing recipe saves $$$ because Nuts are just so EXPENSIVE!! This recipe only uses unsweetened coconut chips which I just started purchasing from Tropical Traditions in a 2.2 lb bag for $8.50. WOW! NOTE: I used Tropical Traditions Chips or other Bob’s Red Mill Flaked Coconut! Why the 2 brands have 2 different definitions, I do not know! This cereal really did remind me of eating Frosted Flakes cereal but without any corn, sugar and processed junk! If you were one of those to eat cereal right out of the box (I was in my former life), this cereal is great all by itself! Don’t think you can sit down and eat the entire batch in one sitting. Be careful not to over consume any food, healthy or not! Also, coconut has very little protein so I would advise eating some form of protein with it if eating for breakfast. You may wonder if it taste like coconut. I personally don’t think it does. I taste the touch of sweetness and vanilla and not the coconut. Give it a try to let me know what you think! More important, what do your kids think!! **I have not tried this with any other sweetener other than Pure Kal Stevia. If you do, please let me know how it turns out. Preheat oven to 300 degrees F. Line 2-3 jelly roll pans (cookie sheets with sides) with parchment paper. Using 3 cookie sheets will speed up the dehydrating process (see Fast Method below). In a large bowl, add water along with cinnamon, nutmeg, vanilla and Stevia. Whisk until dry ingredients are dissolved. Add coconut flakes and stir well until flakes are evenly coated. Be sure flakes are not sticking together. Taste for sweetness. Add more sweetener if desired. FAST METHOD: Divide flakes between 3 cookie sheets and spread out evenly. Bake for 15 minutes. Carefully remove from oven and carefully stir. Return to oven for another 5-10 minutes or until the flakes are slightly golden brown but NOT BURNED! OVER NIGHT METHOD: Divide flakes between 2 cookie sheets and spread out evenly. Bake for 15 minutes. Carefully remove from oven and carefully stir. Return to oven for another 5 minutes. Turn off oven and leave for anywhere from 2-4 hours or overnight. Allow to cool and then transfer to an airtight container. Will keep a few weeks in refrigerator. Top with fresh or freeze-dried fruit and dairy of choice. Note: Cooking Times may vary. This is how I store and measure my cereal. I could not find the exact container online but THIS ONE is similar. 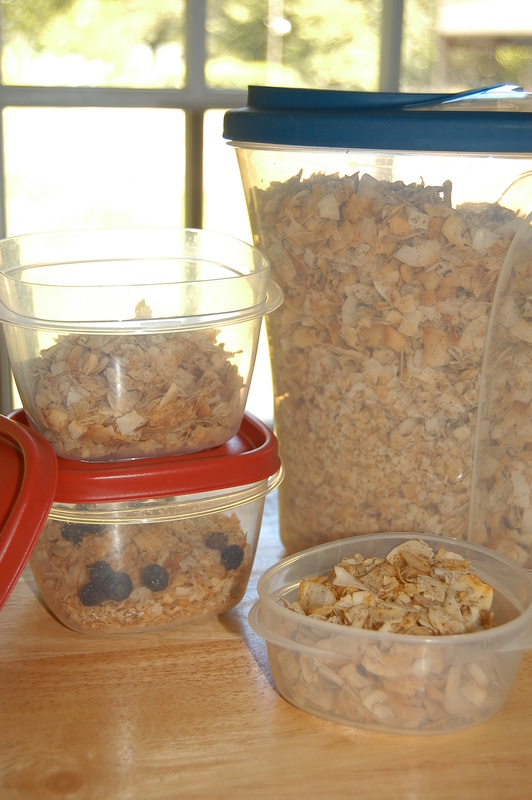 Portion out into bowls with lids for pre-portioned bowls of cereal! Disclaimer: I have linked to different items in this post. By purchasing these products using the links provided, I will receive a small commission on that sale. Proceeds are used to purchase ingredients for new recipes. Thank you for your support. Mmmm, Thank you! I think I may try this in a dehydrator. I know I won’t get the toasted effect though but I do not have a working oven at the moment. Angela, let me know how it works in the dehydrator! Sounds great – love your recipes! Does this have a very coconutty flavor? Also, do you think this would work with honey instead of stevia, if so do you have any idea how much honey would be used in it’s place? Thanks!!! Jen, I personally don’t think it taste like coconut. It taste sweet with a touch of cinnamon. Let me know if you try honey… I am worried it would burn or either carmalize….that would be awesome! Your recipes all sound yummy and I’ll be trying as soon as my new cookbook arrives. I’m confused though on the almond flour you use. On the Honeyville website they have blanched almond flour and natural…which do you use or prefer or are they pretty much the same? Karen, I use blanched almond flour. The unblanched still has the skin on and is a little more course. Just made this and it got the big thumbs up from the kids and myself 🙂 Oh and no sweetener for us. Glad you and the family enjoyed it Bron! I used 2 tbs of your cajun seasoning mix, 1/8 tsp Pur Kal Stevia,1/8 tsp liquid smoke, 1/8 tsp smoked paprika to make a savory version. The taste reminds me of Lays BBQ potatoe chips. That sounds good Andi! I love BBQ chips. I have done something simular with plain pork rinds! Glad you enjoyed it! I usually finish mine off by leaving in the oven to crisp up! I have been meaning to try it with honey… I’m glad it worked! I just has a bowl for a snack… I felt like I was cheating! Just made this recipe and it is amazing! Thank you so much! Before this wheat free lifestyle I LOVED cereal. I have missed it and this tastes exactly like sweetened corn flakes! I have really been enjoying your recipes! Thank you! This looks so good!. I love your recipes!. Can you make a healthy version of candied yams with marshmallows recipe? and totally sugar free jello recipe?. Most of the naturally sugar free jello recipes still are made with juice or fruit, which still has a lot of sugar. Maybe put in a Stevia, Xylitol or another naturally sugar free subsitute drink/beverage in it instead of the juice or fruit – any ideas?. Looks amazing! I can’t wait to have cereal again without all the bloat. I am allergic to Stevia so will be using dates with the 1/2 cup water instead. Thank you for the recipe! Just made this – it is SO good. I felt like I was actually cheating instead of making a healthier choice. Thanks! I am so glad to find this recipe! Not only did I used to LOVE corn flakes, but I just bought an abundance of coconut chips, and then thought “what am I going to DO with all of these?” Problem solved. I have just recently found your blog, and have enjoyed several of your recipes. Great recipes! I just found your site and I’m eager to try some of these. Also interesting that we share the same name, and the very unusual spelling. I don’t find many who spell it this way, and I remember having to spell it for others my entire pre-married life! Well I have to say I love most of your recipes but this one was a huge disappointment. It didn’t taste anything at all like corn flakes, I threw it out :(. Did you dehydrate or toast it long enough? If not, it will be chewy and not crunchy. Also, be sure to taste it before you bake to make sure it is sweet enough or if you want to add more vanilla or spices. Yesterday I added pumpkin pie spice. It is impossible to 100% replicate frosted corn flakes but I think this is a pretty good attempt. I hate that you threw it out… If you don’t want to eat it as cereal, it should be tasty enough to munch on kind of like sweet chips. With any recipe, taste it before you bake it to see if you need to adjust anything before it goes in the oven. Hope this helps. Thank you Melissa I thought I toasted it long enough some of it almost looked like it was beginning to burn but it was a bit chewy. Maybe I’ll try again. Thank you for all your hard work, it so helps me stay on this plan. I, too, am getting results that are chewier than I would like. I am using coconut flakes from the bulk bins at my co-op. Will keep trying to get them more toasted and dried out. Anna, make sure the flakes are in one layer and you may need to cook them longer. Allow them to brown slightly without burning. I hope the helps! I jut tried to buy the coconut chips at Tropical Traditions but they aren’t available at this time! The coconut flakes are available but they won’t be the right size for the “corn” flakes. grrrrrr! Hi! This sounds awesome! Is there a carb/fiber count on this that I missed? I made this tonight. Super yummy! I can’t wait to have a serving in the morning. Also, I checked out both Wheat Belly and the Wheat Belly Cookbook yesterday at my library. I can’t wait to check them out. Thankfully, I have been on a lifestyle change for about 4 months now and have a lot of the main ingredients on hand in my pantry already. I’m looking forward to learning more & getting rid of this belly! Erin, I’m glad you enjoyed it. Keep me posted and I look forward to hearing about your success! This looks amazing and really easy. I’m going to try this using coconut sugar instead of stevia and I’ll let you know how it turns out. I have made this a few times now and tweaked the recipe slightly. 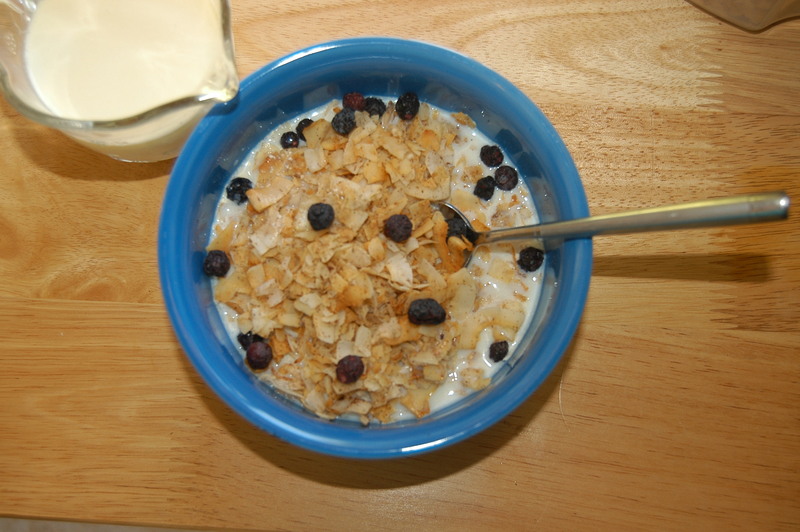 I added a bag of chopped walnuts to the mix to make it more like honey bunches of oats cereal. It came out great. I don’t like the bitterness of stevia so I used Xylitol Honey, some Ideal Sweetener, and little bit of sugar free (splenda) maple syrup. I used less water and more of the Torani vanilla syrup. The key is leaving it overnight I have found to get it to dry out as much as possible. Glad you have enjoyed the recipe. I think everytime I make it, I change it up a bit! It’s SO wonderful to have “cereal” again! Yes, it must be dried out to be crunchy! Thanks for your feedback Elise! 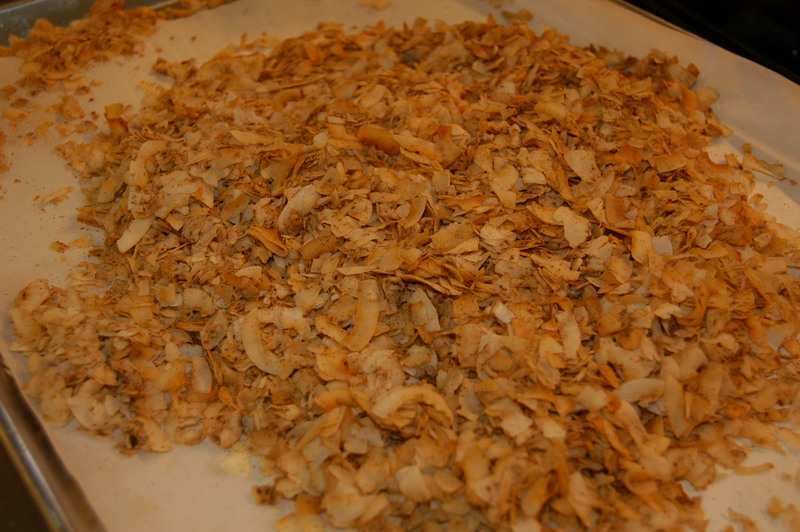 they sell “toasted” coconut chips. I wonder if you could just use them and skip the oven process in a hurry. I have my first batch of this in the oven now. Of course I had to taste pre-baking and even that was yummy. Thank you so much for this recipe (and so many other recipes from your books that have made this grain free deal pretty easy)! 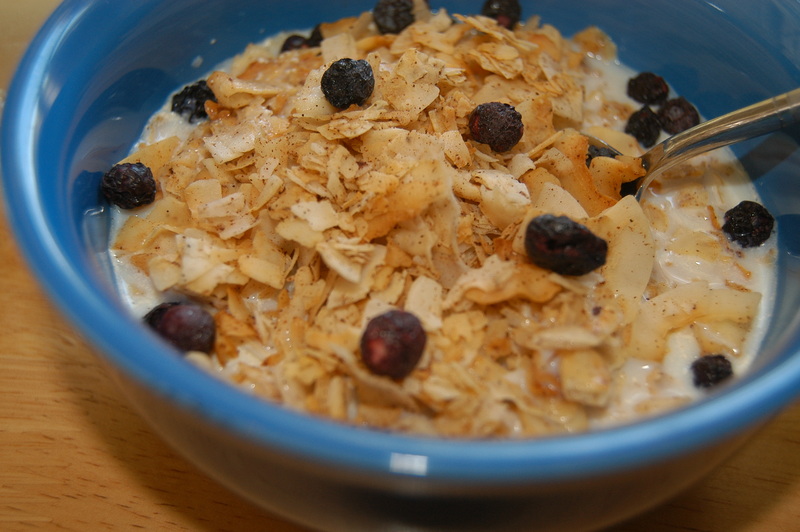 My husband LOVES cereal and this is the first low carb cereal I have given him where he has said, “Oh, that’s good! ” Success! I may be able to get him grain free yet! 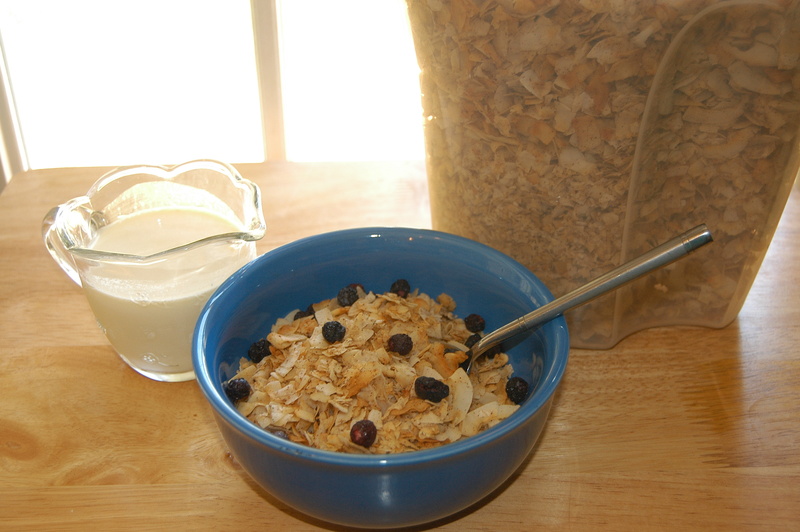 I think I am going to mix it with some grain free granola and hopefully get something like honey bunches of oats. Thanks again! P.S. As another mother of small children I am amazed that are able to find the time to create so many awesome recipes all the time. Good job on that! Hi, I can’t wait to try this recipe! I’m on Atkins and miss cereal a lot. I’ve recently found almond milk and I’m dying to put it on “cereal”! Can you tell me the net carb count on this though? Thanks! Kelly, I hope you enjoy! Net Carbs are 1.5 grams per 1/2 cup! Enjoy! Thank you! Also, do you recommend the overnight method over the fast method? And I only have one jelly roll pan….could I just do it in batches? Kelly, I would just do it the fast method in small batches. It really won’t take long. Ok thanks! Ok…last question, I promise, LOL! I picked up a bag of the Red Mill coconut flakes today and just realized it’s a 12oz (3/4 lb) bag……can I just adjust the measurements of the other stuff so I don’t have to wait ’til tomorrow? Reduce each by 1/4, maybe? Kelly, yes, just lessen the sweetener and spices a bit. Enjoy! I just had to leave word that this is a life changing recipe! It is so easy and so delicious! Thank you so much for sharing!!! It’s like the amazing child of corn flakes and granola! It tastes a lot like granola to me because of the spices, and also the high fat content in the coconut getting nice and crispy in the oven. SO GOOD. Only had enough flakes to make 1/3 recipe, but can’t wait to make a whole recipe next time. Thank you, thank you, thank you!!! I have the trader joes stevia, did you mean 1/2 tsp of the liquid or powdered stevia? Thanks for another great recipe! I love your granola recipe! Rebecca, I have the organic powdered stevia from Trader Joe’s in the little bottle. You can use any kind but the 1/2 tsp. will be more precise for this kind. I hope you enjoy! Love this! I buy my coconut in bulk from Azure Standard.com. 5 pounds for $14! This has become a staple at our house. My two kids can serve themselves breakfast in the morning — hallelujah! I’ve begun experimenting with adding a few tablespoons of melted butter to the mixture, before baking. I’m not sure if it makes much of a difference, but so far, it doesn’t seem to hurt anything. Also, a very small drizzle of maple syrup to the liquid mixture, thinking that having actual sugar might help the flakes crisp up more.